PNoy treated some 60 members of the MPC (Malacañang Press Corp) to a farewell lunch and conceded that all in all the media was “reasonable” in its coverage of his six-year administration. PNoy, who had criticized media time and again, treated the MPC, composed of accredited media representatives assigned to cover the Palace, at the President Grand Palace on Ongpin Street in Manila’s Chinatown district, one of his favorite restaurants. PNoy said that “It’s not that I am trying to get your approval but I think we had a better deal with the Malacañang Press Corps rather than the outside media elements,”. You might also like: PNOY: I FULFILLED MY PROMISES TO MY "BOSSES"
The officials he mentioned all served as his spokespersons at various times. He admitted he was at times exasperated by journalists who asked him the same question over and over, apparently hoping to get a quotable line or scoop. Standard Chinese dishes were served. President Aquino then directed his aides to buy bags of the native Chinese delicacies ampaw and hopia, which were distributed to his guests. The two-and-a-half hour lunch was punctuated by light banter and laughter. The oft-repeated question about his lovelife was again asked of the President, who ends his term on June 30 at the age of 56 years old as a bachelor. PNoy shared a sort of romantic story with the journalists. He said he had heard that his mother, the late President Corazon Aquino, had bought a fabric for a possible bridal gown for his then-girlfriend, thinking that her only son might finally end up at the altar. “I had a girlfriend before and allegedly, Mommy liked her so she (Mrs. Aquino) had a fabric bought. Of course, it was white for the wedding. Mommy gave it to her couturier and until now that fabric is with the couturier and the fabric had already turned yellow,” Mr. Aquino quipped, referring to venerable designer Auggie Cordero. The President said he wanted to talk to Cordero, who still maintains his Manila atelier, to ask if the fabric is still yellow. “Maybe the color has already changed. 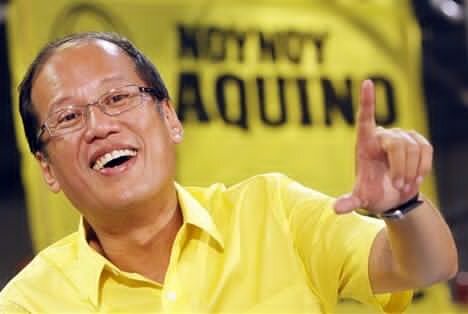 And if I get lucky, I will share with you our color motif,” President Aquino chuckled.